Emerging heavy rockers BUDDERSIDE have made a huge name for themselves in their native Los Angeles and beyond, and plan to spread their wings even further this winter with several new U.S. tour dates reaching the East Coast! 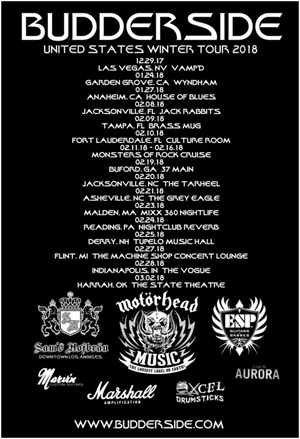 Continuing on the success of their recent shows in Las Vegas and Anaheim, BUDDERSIDE will head back out on the road with LA GUNS beginning February 8 in Jacksonville, FL. The tour will visit several more eastern U.S. cities, coming to an end in the Midwestern city of Harrah, OK on March 2 (this last show will not feature LA GUNS). See below for all confirmed tour dates. Frontman Patrick Stone says: "Yes, yes, OH YESSSSSS!!!! Feeling a bit bona fide. We've been on the road with LA GUNS almost five of the last eight months. Extremely psyched to hit cities we played during our summer and fall tours again, along with some new ones. Both bands are on fire, don't miss this show!" BUDDERSIDE's searing-hot, self-titled debut album, Budderside, is out now via Motörhead Music. Order now via Amazon and iTunes. BUDDERSIDE's story - one of dreams, dedication, survival, struggle and eventual success - makes them a people's band through and through. The band features Stoneman from Massachusetts on bass, Rich Sacco from Buffalo on drums, Colin Reid from Vancouver, BC on lead guitar, and from Northern California, guitar player and vocalist Patrick Stone. The band's eponymous debut album articulates their journey via a series of engaging, raging and rocking songs, including their latest video cut "Genocide". The album even features guest guitar appearances by Phil Campbell of MOTORHEAD and sax by Katja Rieckermann of Lady Gaga and Rod Stewart. Budderside was recorded at Rosewood Strat Studio with producer Paul Inder Kilmister (son of Lemmy Kilmister). Infectious, gritty, contagious and altogether dangerous, BUDDERSIDE demand your fullest focus and most engaged attention.